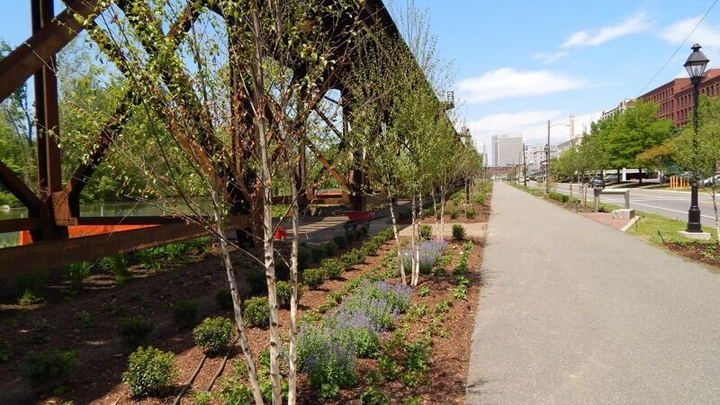 The first phase of Capital Trees Low Line project includes removing invasive plants and trees, installing a rain garden to mitigate stormwater runoff and planting more than 50,000 trees, shrubs, grasses, perennials and bulbs. Thousands of native plants and trees are turning a neglected area under a working railroad trestle into a five acre garden. In addition to creating beauty and attracting more people to the waterfront, Richmond’s Low Line has environmental benefits too. Catherine Komp has more for Virginia Currents. Learn More: Find out more about the Low Line and Capital Trees and follow their projects on Facebook. Watch a segment on the Low Line on Virginia Home Grown and learn more about the plants used at Richmond's linear park. Jeanette McKittrick: When we first got here, it was rather desolate and this area to the West, which is now the Low Line was completely overgrown, you couldn’t see the canal. Capital Trees got to work. They began with some small projects at Great Shiplock Park, like building planters from reclaimed cobblestones. But the organization’s mission goes beyond beautification. They wanted to do something about all the stormwater pollution that rushes into the canal, then the James River and eventually the Chesapeake Bay. Capital Trees member Meg Turner steps over to the park’s rain garden, a stormwater management technique growing in popularity across Richmond and communities nationwide. Turner points to where they dug out the dirt, replacing it with gravel and a mixture of stone and sand. Topped with soil, they planted natives like joe-pye weed, switch grass and sea oats. Turner: It’s filtered through the plants, the plants then absorb a lot of the pollutants, some of the water goes into the ground, becomes ground water and then the overflow, when there is a large rain event, flows into the canal but it’s now cleaner water and it’s had the time to filter down into the roots. Turner and McKittrick look at tiny speckled insects they hadn’t seen before on the mauve blooms of the joe-pye weed. This is another goal of their initiative: integrating plants that provide multiple benefits. Turner: We wanted to have a beautiful and functional landscape and by functional, I mean increasing the biodiversity and helping to create stability in the ecosystem. In doing that, we have plants with four seasons of interest. We naturally want [four seasons of interest] for the beautification, but at the same time the ecosystem needs the four seasons because you have some insects that pollinate in the Spring, some in the Summer and some in the Fall. You need food for the birds all seasons, you need nesting, you need cover for wildlife, all at different times. So all of that together serves both our ecological needs and our aesthetic needs. The origins of the Low Line go back about five years ago. Turner filled her car with 10,000 daffodil bulbs from a seller in Gloucester. The weight of the bulbs was so heavy they blew out Turner’s shocks. But the bulbs made it to Dock Street and with the “girl power” of the Richmond garden clubs, they started planting. McKittrick: We had permission in all of our other projects and we certainly have permission now for doing everything we did, but maybe we didn’t have permission to do that (laughter). No one complained, says McKittrick, when large, bright patches of yellow and white emerged the next Spring. Since then, Capital Trees has worked with numerous entities, including the city and CSX Transportation, to develop the five acre Low Line. The name references New York City’s popular High Line, a park built on an elevated train track. Turner: Once it’s all complete from canal to trail, you have cars, you have trains, you have canal boats, you have on the trail, cyclists and walkers. So all these people who go by everyday are getting to enjoy this beauty. The budget for the first phase of the Low Line is more than a million dollars, which includes funds for maintenance and upkeep. More than 50,000 trees, grasses, perennials and bulbs have been planted. Turner estimates there’s 80 to 100 different species, mostly native. As we walk along the trail, we pass high bush blueberries and a patch of clethra. Turner: This is a rare summer blooming native shrub and it is a real wonderful source of nectar for butterflies and as we can see, bees are all over it. Next to it is the white wood aster, it provides nectar, it provides pollen, it provides caterpillar food and it is also a host for over 100 different caterpillars. Above the Low Line, up the hill, are the old tobacco warehouses, now converted into condos, restaurants and offices. McKittrick says they wanted to bring some of that history to the park, so in June they planted tobacco. McKittrick: You can see that some of it’s thriving. We’re not tobacco farmers but we thought it would be appropriate to bring it back down here to Shockoe Bottom. Trees include native redbuds, sweetbay magnolias, hop hornbeams and service berries. There’s snowdrop windflowers, cat mint and blue and red lobelia. Designed by landscape architects at Waterstreet Studio, the garden's shape complements the linear structure of the train trestle and canal, the trail and the road. Turner: It pulls all that together and it then also gives us our backbone so that in winter seasons when the perennials go dormant, you’ll still see that strong structure. The Low Line is a work in progress. Capital Trees will continue to raise funds, remove invasives and expand the plantings along the trail and under the trestle. Further West by the floodwall, they have their eyes on giant, eight inch pipes under 1-95. These funnel massive amounts of stormwater runoff into the canal. More rain gardens and natives will mitigate that pollution. And they’d like to do more work on the canal’s banks, drawing more attention to the area’s history. McKittrick: There are people in town who would like very much to see this lock restored, to see that Norfolk & Southern bridge restored to being able to be open and closed again and see pleasure craft come back through here. And some semblance of city’s docks restored, they can’t be restored entirely because this area was filled in when the train trestle was built. But we would like to see a lot more happen down here, a lot more fun things happen down here and opening up the Low Lines for people to see what the possibilities are is a first step. Earlier this year, the Low Line and Great Shiplock Park were added to the Governor’s “Virginia Treasures” initiative, a land, water and recreational conservation program. Capital Trees also says this area, along with Shockoe Bottom’s significance in the slave trade, meets five criteria to apply for designation as a UNESCO World Heritage site. For Virginia Currents, I’m Catherine Komp, WCVE News.